In modern legal systems, the legal aid service is evaluated in human rights terms. This is especially important in criminal cases. Legal aid is also among those continued improvement efforts in Turkey's bid for EU membership. It is therefore of utmost importance that this perspective is given due consideration by legal scholars from Turkey. Prepared with such an approach, this book contains the presentations, discussions and recommendations made at the Roundtable Discussion at Istanbul Bilgi University on 16 April 2004. Furthermore, "The Basic Assessment Report of the Legal Aid Delivery in Turkey", presented at the Roundtable is published for the first time herein. The book is prepared in both Turkish and English, for the benefit of Turkish as well as international legal scholars. 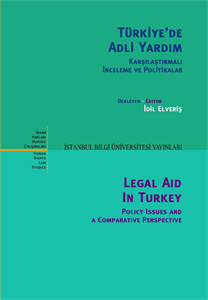 This manuscript was prepared for publication with the contribution and cooperation of the "Working Group on Judicial Reform and Access to Justice" operating under the umbrella of Istanbul Bilgi University Human Rights Law Research Center.